Atlanta experiences its share of hailstorms for a typically moderate climate. Hail doesn’t have to be the size of a baseball to cause damage to your roof. Even a moderate hailstorm can cause enough damage to compromise the ability of your roof to weather future storms. But hail damage assessment can be tricky; damage is frequently not apparent from the ground or to an untrained professional. Do you suspect you have hail damage to your Roof? What’s the best thing to do? Don’t go climbing on your roof with a checklist you downloaded from the Internet. Instead, get a free professional roof analysis. Call a professional roofing company that has proven expertise in hail damage repair (like LB Roofing!) to come out to your home, go up on our roof and assess the damage. Our trained experts will be able to determine if there is enough damage to file a claim and if a claim is justified, we will help assure that you receive the proper compensation from your insurance company. 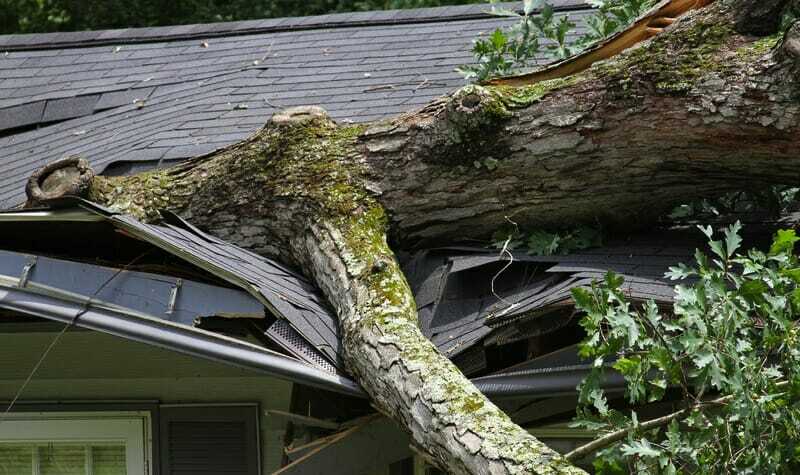 We will adequately document your roof damage and contact your insurance company on your behalf. 1. The damage may not be apparent immediately. 2. The damage from hailstorms may simply be cosmetic and the life and effectiveness of the roof isn’t affected. So, to determine if the damage to the roof is significant enough to warrant repairs, your insurance company will want an assessment of how many damaged spots (hail impacts) per roof square (10 foot X 10 foot) area. The most common way insurance companies document hail damage is to measure off random squares of shingle on your roof and count the number of dents, cracks or exposed asphalt which hail caused in those areas. This assessment is usually done in one location on each side of your roof. If the amount of damage is greater on one side of your home than the other, your insurance company may provide compensation for a repair and not a full roof replacement. Has your roof been exposed to hail damage? Proper assessment of composite shingles can be tricky. Composite shingles are designed to protect your roof from water by using a tar/asphalt layer covered by gravel and granules that protect the tar from the UV rays of the sun, and also give the shingle its color. This means that hail can cause future damage to a roof by dislodging the protective granules on the surface of shingles. Even if there is no apparent damage after the storm you may see loss of granules or the appearance of bare shingles in the next few months. If left un-repaired, shingles damaged by hail may eventually lead to leaks and more severe damage than was originally created. We are trained to look for the subtle damage spots and determine the extent of the damage to your roof. Call LB Roofing today at 404.875.6222 in Atlanta to schedule your free expert roof analysis.